Some may remember my black and white Birch-bark covered Egyptian composite prototype. Here is the upcoming horn version, somewhat more ambitious. She will need to rest a few more weeks before a trial stringing. She is Nubian Ibex horn on an Ash core as were the originals. My Elk leg sinew will have to approximate the original. This bow's name is Isis. The form is at the lower of the photo. 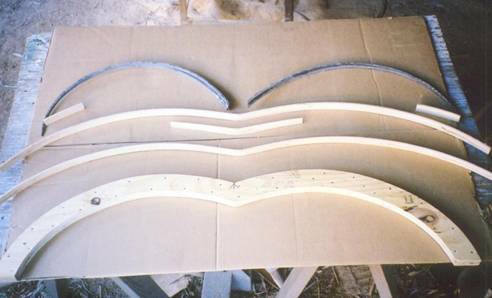 Two pre-steamed Ash laths make the limbs with the riser BETWEEN them; blocks for the tips should be below the laths. The horn follows on the belly. The unstrung shape is somewhat misleading. I am hoping that it makes a near triangle when strung. I wanted to have more reflex. But there are several Egyptian tomb paintings showing the royal archery workshop and none of the drying bows has extreme reflex. Because of the presence of birch bark on so many bows, it seemed natural to go to a harder core. There are no artifacts of any type from the period of birch wood. Birch bark was the commodity. And Water buffalo horn is much denser than Nubian Ibex, but Ageans are shown arriving with goat horns as tribute and these horns are shown being cut up in the Royal workshop so there I am. In one Central Asian phylosophy, the bow is a woman, the arrow is a man. She sends him out to do her bidding, and he immediately responds. 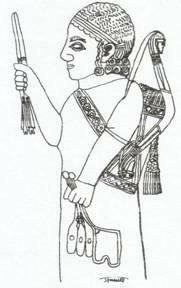 This is a drawing of a Neo-Hittite, c.750BCE, after Von Luschan. Note that his bow is just a lick different than a Scythian one. Guess which release he uses.